I’m a huge fan of history – I studied it for three years up in the good ol’ north of England as an undergraduate. I loved the early modern period and I have fond memories of learning about the Tudors back at school (didn’t we all). I was fascinated by Elizabeth I; by her staunchness in not wanting to marry, by her relationships that she adored and kept at a distance in equal measure, and by her resilience in the face of men who wanted nothing more than to see her fail. But I don’t know that much about Mary Queen of Scots. In fact, I thought she was the famous ‘Bloody Mary’ that young kids are terrified of. (They are, it turns out, very different people). I joined my friend Anna at a screening of the film this week (I know right, she’s fancy). After bagging myself an entire backpack’s worth of chocolate (it’s a long story) we settled in to the glorious Everyman Cinema in King’s Cross. I’d forgotten how nice the Everyman screens are; full of plush seating, little tables to put your cocktails on and two-women sized sofas. Perfect. But I wasn’t that excited for the actual film. I’d read mixed reviews. And I’ve been a bit bored by historical dramas without any interesting spins. (The Favourite being a recent exception). Turns out, I really enjoyed it. Mainly because of the acting. And the history lessons. And the let’s-see-if-we-can-spot-the-drama-school-graduate game. The casting was on point, the setting was wild and wonderful and Saoirse Ronan was, as always, fantastic. Ronan, as the eponymous Mary, admittedly had a lot more to play with than Margot Robbie as Elizabeth I. I couldn’t help but think that a less-famous actress would have got a lot more out of this role. And I’ve always envisaged Elizabeth as a stand-out character; taking the limelight in stories. Wielding her powers and shouting at her contemporaries. But it was Mary’s passion that shone through at every turn. Shouting wasn’t necessary here (take note, people). She nailed her Scottish accent (although, to some extent, we all would if we could afford a dialect coach 24/7…..), she played a range of emotions beautifully. And her relationship with the charming but problematic Lord Darnley, played by Jack Lowden, was mesmerising. I suppose this is the crux of it. The story paints itself as a tale of two competing Queens but the women don’t actually come into contact until the end of the film (in real life they never did). Instead, you can’t help but focus on the relationships with their other halves and with the ladies in their court. Mary is intoxicated with Darnley when they first meet. Elizabeth, by contrast, fusses a lot about her ‘lover’ Robert Dudley (played by The Favourite‘s brilliant Joe Alwyn – seems he loved a period drama) but their closeness isn’t given much limelight. It’s difficult to really invest in them as a result. Mary has strong-willed ladies-in-waiting at her side, defending her at every corner. 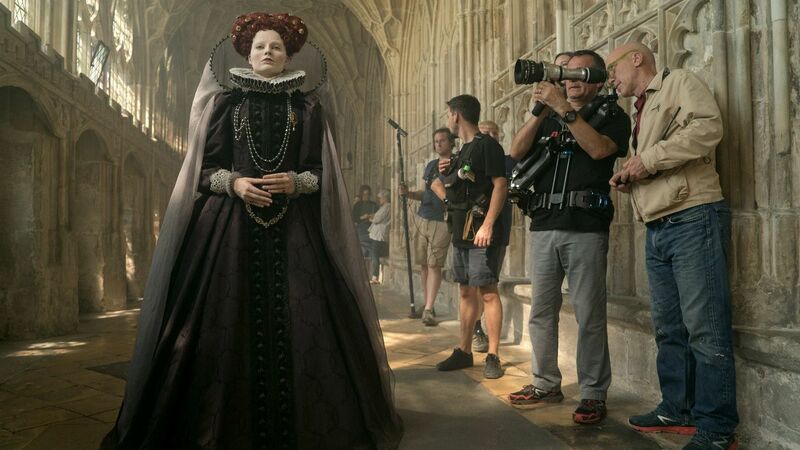 Elizabeth, on the other hand, and her court ladies aren’t given much room to shine, despite having a renowned actress playing in one of these roles. And to top it all off Saoirse Ronan’s Mary has David Rizzio, played by Ismael Cruz Cordova, in her company. Creating conflict, heartache and, ultimately, devastation. Now, that makes for some good drama. Director Josie Rourke did a fine job in this role – striking a balance between humour and highlighting the plight of these women without getting too worthy. Though I wasn’t always sure about David Tennant’s anti-Mary ramblings. ‘There are things far worse than famine and this includes a woman with a crown’. I suppose the viewer was encouraged to look on and laugh but I felt there was something a bit lacking in these instances. I did love the use of music too. Composer Max Richter worked his magic here using injections of a sort of Tudor/gritty mix (new Spotify genre, anyone?) that kept me on my toes throughout. Just when you get comfortable watching a romantic scene play out, the unsettling booms reminded you that a castle might get blown up or a beheading was on the horizon. Just your average weekend, then. While the film won’t be getting an Oscars nod, it’s definitely worth your time on a Saturday afternoon or a cold Thursday evening. Saoirse Ronan’s role is also a nice lesson to actors. She’s gone from an angsty-American teen in Ladybird to Scottish Queen in the space of a year. In an industry that loves putting people into boxes, it’s refreshing to see that maybe, just maybe, we can work to break the mould. ‘Actor’ in the dictionary is defined as ‘someone who pretends to be someone else’, after all. Right, I’m off to audition for Batman.